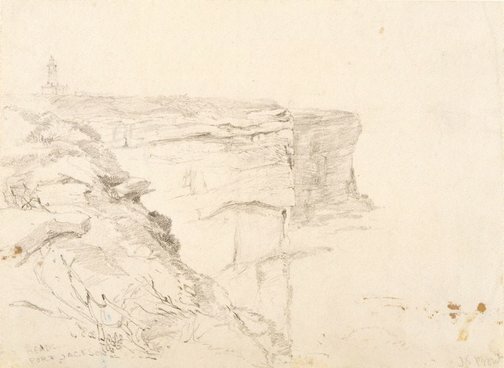 "The present view, which is taken from the cliffs, a little to the South of the Light House, give a faithful and characteristic representation of the scenery around the Heads... Macquarie Tower and Light House (containing a revolving light), is situated on the highest part of the outer South Head of Port Jackson Harbour... To the North of the Light House, on the dark cliff in the centre of the picture, stand the Signal Station, Signal-post, and Telegraph, which communicate to the Station on Fort Phillip all information about vessels entering or leaving the harbour". A steel engraving by Charles Cousen (1813?-89) after Skinner Prout is included in Edwin Carton Booth's 'Australia illustrated' (1873-76) opposite pg. 105. Signed l.r. corner, pencil "J S Prout". Not dated. Hendrik Kolenberg, 19th century Australian watercolours, drawing and pastels from the Gallery's collection , 'Introduction', pg. 6-16, Sydney, 2005, 9, 39 (colour illus. ).